Take a beautiful, blue sky day, situate yourself at the head of the Rivers of America, and gaze upon the rustic beauty in front of you, and it's hard not to feel good. 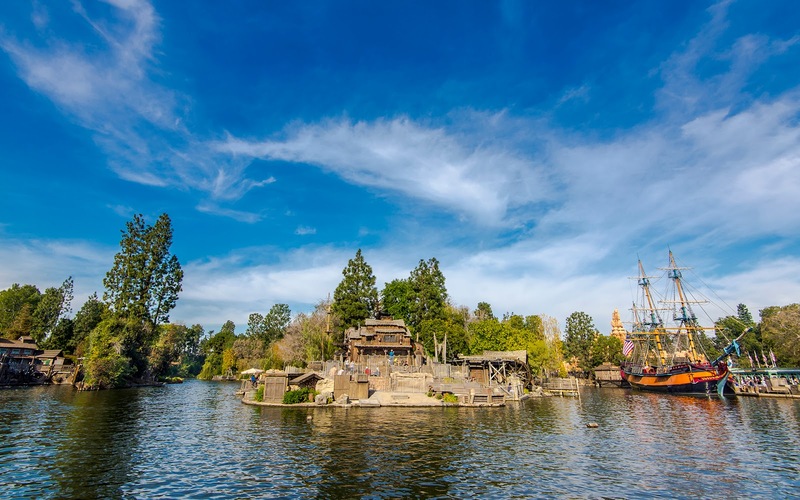 The calm, scenic waters, the 19th century sailing ships, and the allure of adventure at Tom Sawyer's Island come together to invigorate that feeling of being along the frontier, and the pretty vista just puts the mind at ease. I often stop along the Rivers of America just to take in the scene. It has a nice calming effect, and I always leave feeling just a little bit happier. Gazing upon the expansive turn of the Rivers of America.